Precisely how much is unclear about the outcome of the general election should be clear by early the following morning. Almost all of the results are due to be declared by 8am, meaning the negotiations, both formal and informal, could be well under way by breakfast time. If you’re already thinking about how long to stay up, or whether to go to bed early then wake up when things are getting exciting, it looks like the key period will be from 3am onwards. 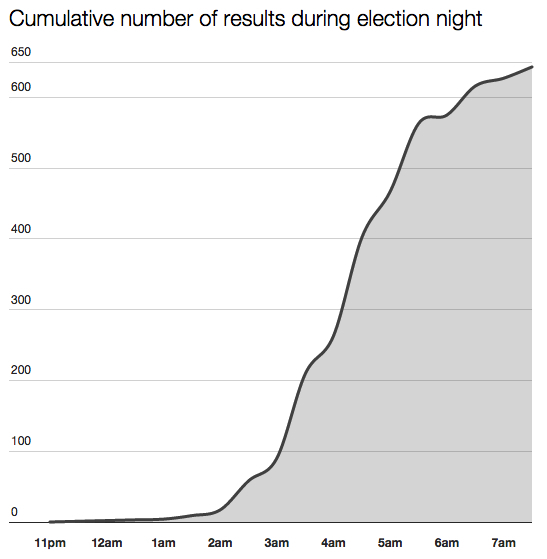 If everything goes to plan, 643 of the 650 seats will have declared within 12 hours of the polls closing. Everything won’t go to plan, of course. But let’s hope we won’t have to wait as long as 2010, when the final results (from East Ham and West Ham) weren’t declared until 8.30pm on Friday evening. 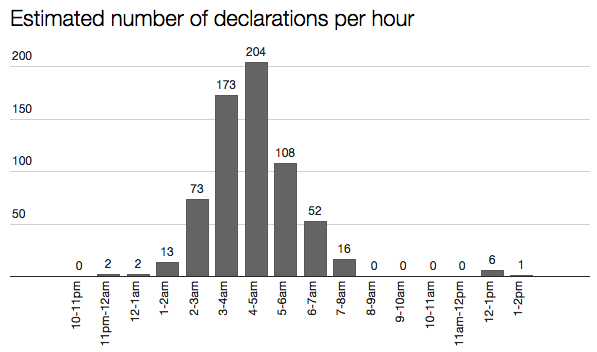 Go to bed early and get up for say 4 or 5am to see most of the declarations, but possibly miss the “Portillo moment” (just after 3am in 1997, I think), or stay up quite but not unreasonably late, and still miss most of it, so it is all over bar the shouting when you get up! Of course we want to see and analyse real results but Exit Polls have been very accurate in recent British General Elections. I expect a lot of declarations to be later than advertised as candidates demand a recount – either because the result is very close or because the minor parties want to save their deposit. At the moment, I will have a few hours kip before 10pm, stay up to about 6am, catch a couple of hours sleep and then go in to work late. Recounts may well be a hallmark of 2015’s election night. We are going to see far more very close contests and far more MPs elected on 30-35% of the votes cast. What is the record for the number of recounts? The most recounts I know of is 7, in Brighton Kemptown in 1964 when Labour took its first ever Sussex seat, by 7 votes.